What is our sockpuppet policy? I flagged a question from our resident troll and noted that it was a duplicate of another question*. That other question was closed as Not A Real Question and deleted, because it was posted by a sockpuppet. “Not a real question” is entirely apposite; it was posted purely to goad the community. Current policy is to delete NS socks and let the question stand (or fall) on its own merits. Surely — as a duplicate — this newest example must also be NARQ? I actually pointed out the link in my flag. When did the policy change, and why? And what do we do with questions which are duplicates? This change wouldn't have anything to do with ELU's perceived closure rate, would it? * 10k only, the question has been deleted. As for what we should do with questions coming from our "resident troll" on their own merits, all questions I’ve seen should be closed Off Topic (out of scope). Questions generally include a link to a page published on the Internet, an excerpt, and a proposed correction. The question is whether the excerpt should, as the OP thinks, be corrected or what the text would mean if corrected as proposed. The proposed correction is usually unnecessary. Sometimes there are multiple proposed corrections. Sometimes there is no link. Sometimes there is an indication that a general reference was consulted before asking. Per the FAQ, literary criticism and critique requests are Off Topic (out of scope). Proofreading is also Off Topic (out of scope) unless the source of concern is clearly specified and unless the question is based on an actual problem that the OP faces.¹ Proofreading other peoples’ published works does not qualify, especially when there is no real problem. Arguably there are more close reasons which apply on the merits. Too Localized (“the Internet is fine” is unlikely to help anyone, not even the poor OP). Exact Duplicate (when applicable). Not A Real Question when the question is unclear or incomplete (lacks context and prior research). 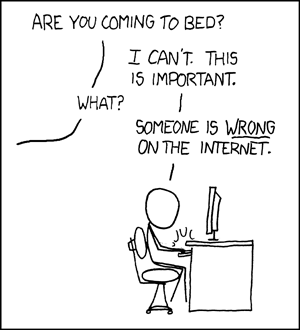 The only close reason that applies less to the merits and more to the troll is Not Constructive. Many of these questions are also cross posted without attribution to other non-SE fora such as EnglishForums.com, WordReference.com, and UsingEnglish.com, the BBC Learning English Message Board, and Yahoo! Answers. When this occurs, the question should also be flagged for moderator review, as that creates a legitimate concern about copyright. It's not to do with our perceived closure rate, but is rather a shift in standard SE policy for handling sockpuppets. By deleting puppets, users who answer the question are not unfairly punished. Account mergers are reduced in number, and shifted to the devs and autobots. Also, content is judged on its face, rather than by who posted it. If a question is good, it remains without rewarding the puppet. If it is not, it is closed or removed. That's for the closevoters to decide (again), without concerning themselves about whether the OP is a puppet or not. For duplicates, you should do what you always do with them. In this case, you can't because it is a duplicate of a closed question. As for voting to close a question as not a real question because the duplicate question was closed for that reason, you should ask yourself: Would you have closed the first question as not a real question? If you would not close the first question as not a real question, then you should not close for that reason another question that is essentially duplicating the first. Probably, you would find the question closable as general reference, if it can be answered looking at a resource thought to give answers to that type of questions. Not the answer you're looking for? Browse other questions tagged discussion suspension trolling . Flagged Asker; Valid Question — Can We Make it Wiki? When a question is later marked as a duplicate, should you delete your answer? Why are requests for headlines off-topic? What about more general work-related questions?